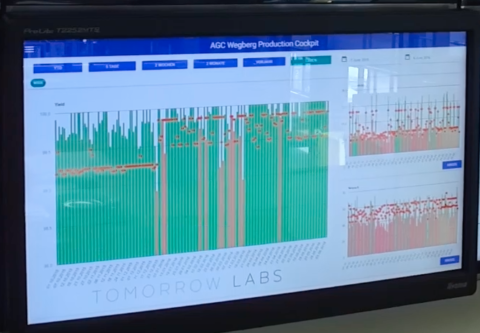 Tomorrow Connect collects and processes machine and sensor data automatically, and visualizes this with the help of eApps. The interaction between humans and machines and cyber-physical systems occurs within eApps from our eApps Store. All eApps work on PCs as well as handheld devices, making them accessible with proper authorization at any time or place. The system is as easy to operate as adding apps on your smartphone. After downloading/setting up Tomorrow Connect, you will gain access to the eApps4Production Store, where you can select your desired eApps. Through the use of real-time monitoring, managers and decision-makers always have the relevant information they need to make decisions. Generally, these include current cycle times, quantity per hour and also the OEE. The color-code system indicates whether production is going as planned, or if there’s a discrepancy between production targets and actual production numbers. 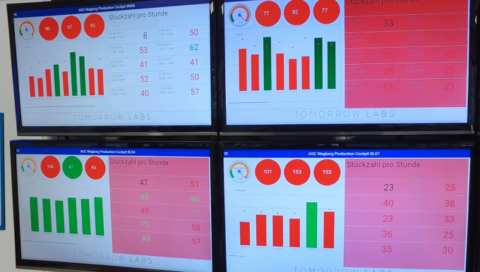 The Tomorrow Connect live dashboards are displayed directly on the machine/production line and on mounted screens or tablets in the office of the shift supervisor. 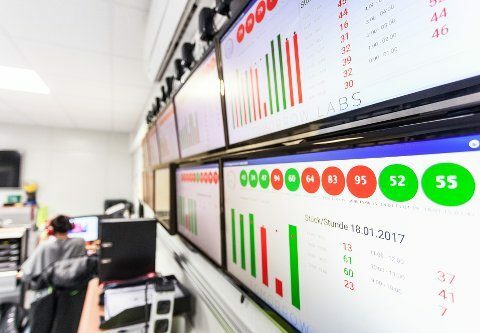 The radical transparency afforded by real-time information allows for a quicker response to short-term problems and results in a 10% increase in productivity (statement of AGC Automotive in Wegberg). The Production Cockpit provides detailed reports and trend analysis for the entire production process. All recorded data can be clearly displayed and all of the key numbers can be aggregated. Our Excel add-in provides access to all the data collected and gives you the option to create real-time dashboards and automated reports, as well as to automate or supplement existing reports. There is also potential for a data exchange with selected enterprise software solutions like SAP. 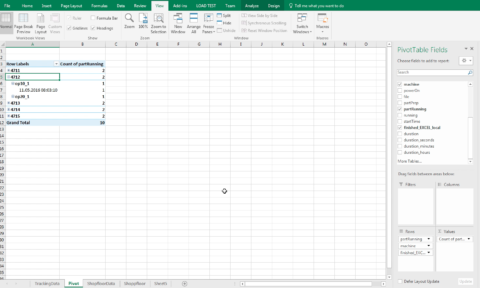 Our customers use our Excel add-in to review their collected data before examining the data according to the key figures they’re interested in (production per hour, waste, etc.). These and other key figures can be selected in our eApps. As soon as there is a standstill in production, an employee can select the cause for the pause from a list in our Downtime-Tracker eApp. This list can of course be edited and expanded by employees. A clearly displayed appendix will notify the manager as to which events are responsible for most extensive system downtimes. As a rule, planned downtime for things such as tool changes can be stored in the Downtime-Tracker, and this downtime will be automatically categorized under certain labels. The Maintenance eApp coordinates, controls, and automates maintenance. The maintenance planning and situation monitoring is carried out based on technical units. Upon reaching and exceeding defined set points, the corresponding maintenance staff and machine workers will be notified promptly. There is a clear and up-to-date calendar as well as a list-view of the planned maintenance available. If, for example, the maximum quantity is stored as a maintenance recommendation, then the eApp automatically calculates the future maintenance date and adjusts this depending on production rate. We have years of experience in Enterprise Application Integration (i.e. the integration and merging of information from third-party systems), during which we worked on numerous projects with OEMs and companies with industrial manufacturing. By default, Tomorrow Connect provides a bi-directional SAP interface. If you want to integrate other ERP solutions and third-party systems, please contact us for more information. With the Tomorrow Labs Software Development Kit, original eApps can be developed and, when desired, be made available to third parties in the eApps4Productions Store. Furthermore, the Tomorrow Labs SDK simplifies integration with existing software applications (ERP, BI, tool management, etc.). Our Tomorrow Labs Connector simplifies the acquisition of machine and sensor data by connecting directly to the control and/or sensor. In so doing, we allow for an easy connection to current and old management models. Furthermore, additional hardware like a scanner pistol or external data storage can be included. 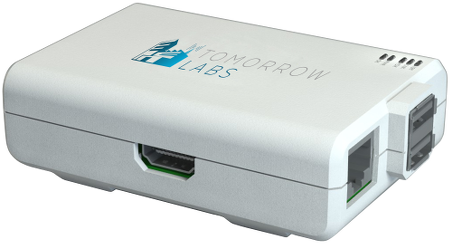 The Tomorrow Labs Connector is often used to relieve the corporate network, as it can instantly consolidate huge amounts of data into key figures and safely route these figures to the corporate network. This reduces the traffic up to 98%. OPC-UA, OPC, MTConnect and Siemens 7 support the automatic data collection of machines at no additional cost. Tomorrow Connect supports more than 100 types of controllers for any additional costs incurred. Of course, we collect data directly from sensors, so that even very old machines can be retrofitted with sensors and integrated into our platform Tomorrow Connect.